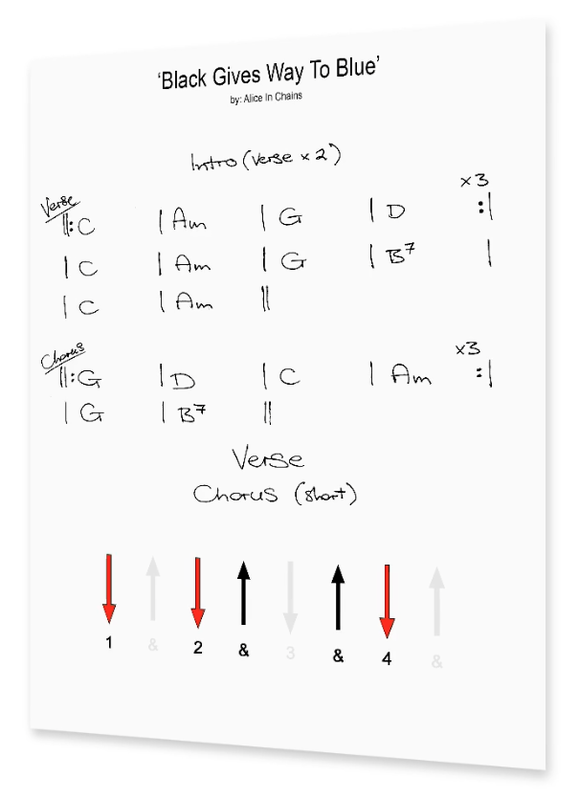 Are you sick of drawing strumming diagrams by hand? If you have ever gone looking for a digital solution for creating strumming patterns you will have soon realised (just like I did) that it's a dead end. It doesn't exist. After 18 years of teaching guitar I became sick of a lack of professional solution to creating strumming patterns… so I created it myself. Unlike so many products with zero user input in their design (dare I say made simply to 'cash in'), I created Guitar Strumming Graphics originally for myself, because as a guitar teacher its something I NEED. Its been designed by the user, for the user. I took what I created for myself and have expanded it to fulfill the needs of other guitar teachers, like you! Editable templates, a wide variety of subdivisions & counting styles, and ready made transparent graphics that you can use immediately. Give your print resources that pro edge and impress your students. 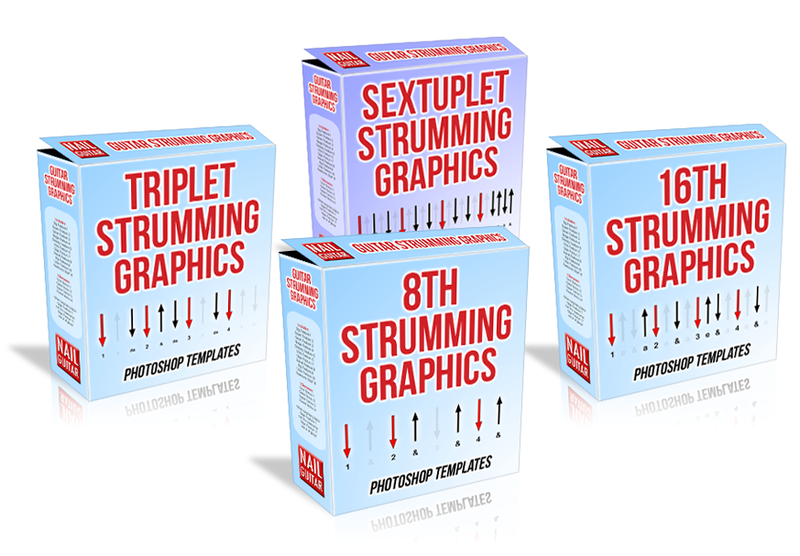 "Guitar Strumming Graphics is simple to use... looks good." "What a time-saver! Guitar Strumming Graphics is simple to use, looks good and best of all, means my students are getting more out of their lessons and less of my scrawl on their pages." Click here - Download your '8 Must Know Strumming Patterns' PDF free! Enter your email below and click the button to get instant access. 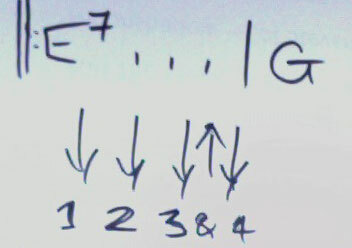 Coloured arrows on numbered beats help the reader to keep track of their position easier. 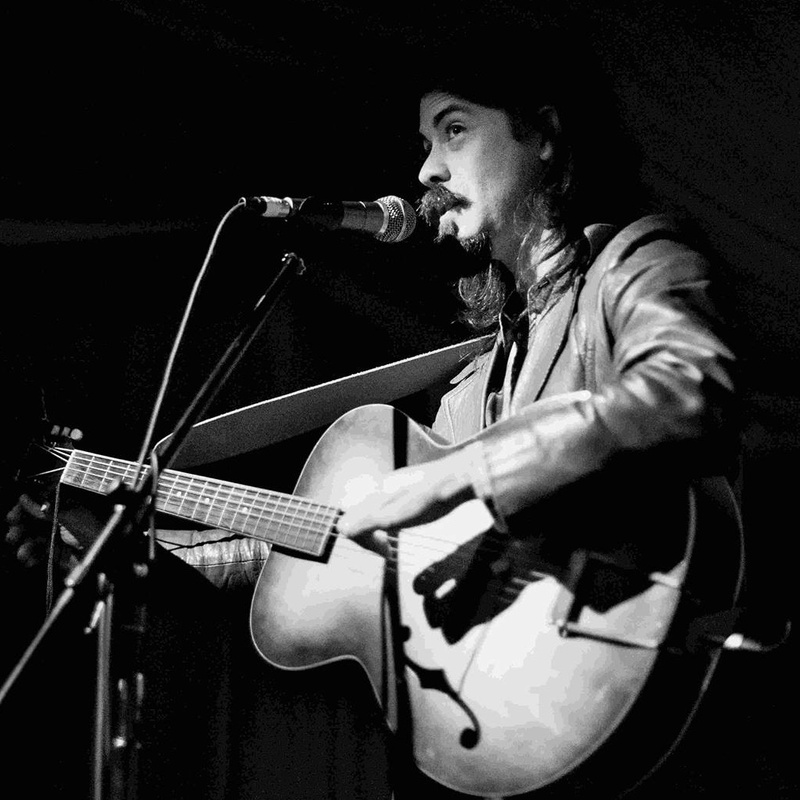 Mini arrows allow you to show when bass notes are played instead of full chords being strummed. Edit diagrams on PC or MAC and even share files between systems if you own both. High resolution 1920 pixels wide image means your diagrams can fill the whole screen. Optional faint grey ghost arrows and counts save viewers from getting lots in 'the void' of sparse strumming patterns. Optional skinny arrows means you can avoid wasting excess ink when printing diagrams. Colour coded layers for easy editing. Guitar Strumming Graphics are layered photoshop & Gimp files making them 100% editable allowing endless customisation. What resources and tools would you like? To sweeten the deal I'm including 2 very special bonus packages to cover all the rhythmic bases! Click Here To Get Guitar Strumming Graphics! 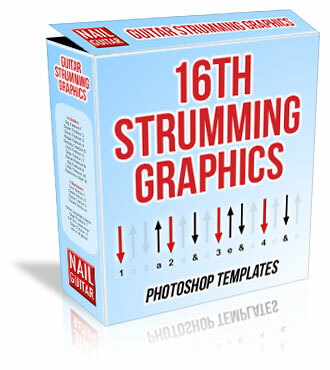 Guitar Strumming Graphics is a Photoshop template package, to use it you'll either need Photoshop or the free alternative program for graphics editing called GIMP. Google search 'Gimp graphics editor' and you can download it right now. Included with the package are some short instructional videos showing you how to customise your own diagrams incase you've never used a graphics editor before. Even if you're brand new to this sort of program I can assure you, its super simple. 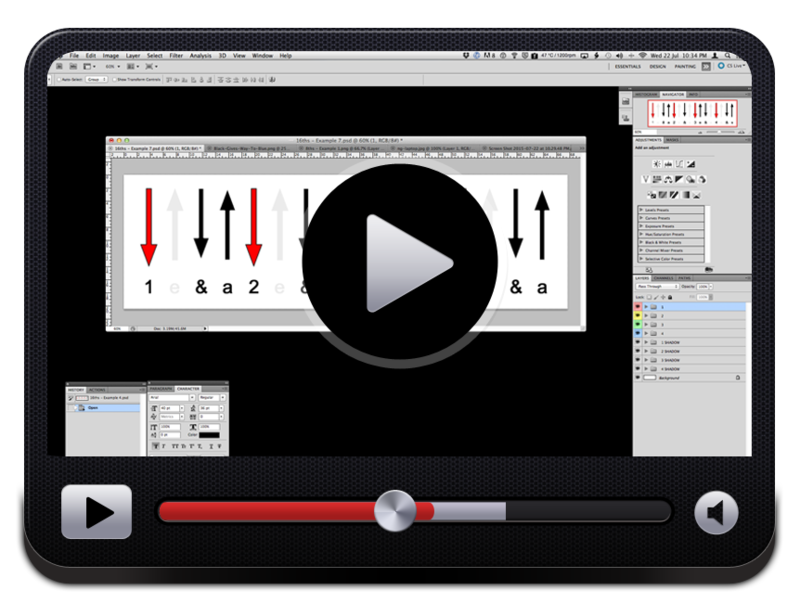 In basic you switch arrows and counts on or off to create your chosen rhythm diagram and export the image ready for use. Note: The layer style functions in Photoshop used for customising colour and creating borders around arrows which doesn't exist in GIMP. For most users this shouldn't be of any concern. It is still possible to customisation colours, borders etc in GIMP but is slower to implement. If you are interested in this functionality I highly recommend investing in Photoshop. When opening photoshop format templates in GIMP the layer style information (colour overlays and borders etc) is ignored, resulting in plain black arrows without borders. As coloured counts make diagrams easier on the eyes I have included master templates with red arrows on counts and instructions how to further customise templates in GIMP if you choose to stick with the free (but slower) program. 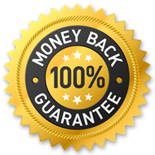 Given the average guitar teacher charges $30 per half hour lesson (that's what I charge) and given its the weeks its taken to produce the full Guitar Strumming Graphics package I could easily charge easily $100 and it would be a super fair price. Remember: Because you teach for a living you'll be able to claim it as a deduction and get sizable portion of the cost back at tax time. I want to make Guitar Strumming Graphics reachable for students aswell as teachers, so I decided to make it just $37. Your Guitar Strumming Graphics purchase is Risk-Free! When you buy Guitar Strumming Graphics, I want you to feel completely comfortable with your purchase. If you feel it doesn't deliver on what you see here, return it for a prompt and friendly 100% refund of your purchase price. This can be next week, next month, or up to 60 days from now. What's more you can even keep the ready made templates as my thanks for giving it a try. You really can't lose. "...Guitar Strumming Graphics has totally changed the way I work." 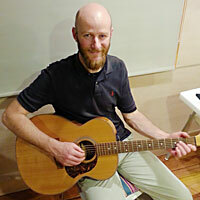 "I have been a guitar teacher for over 20 years and always frustrated at the time it takes me to create easy to read and neat handouts for students, particularly when it comes to strumming patterns. Andy's new Guitar Strumming Graphics has totally changed the way I work. Thanks to this great resource my student handouts and strumming related material now has a much higher level of professionalism and ease of use." 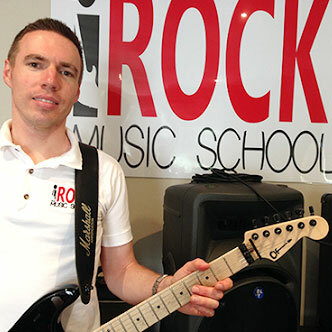 "An excellent resource that I would recommend to any guitar tutor." "Teaching strumming can be frustrating for the tutor, especially with the amount of inconsistent resources and diagrams available. It is confusing for the student because of the many ways in which strumming patterns can be ‘notated’. 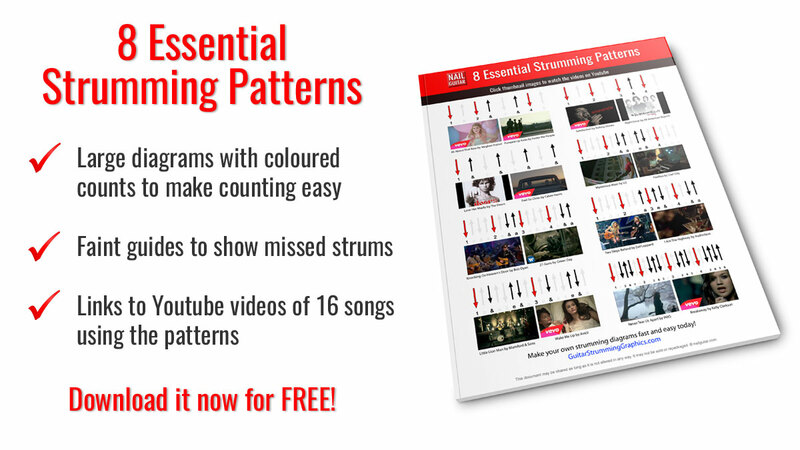 Using and customizing these templates enables me to use a consistent and clear resource that is well formatted, easy to use and which visually represents continuous right hand movement for strumming patterns. 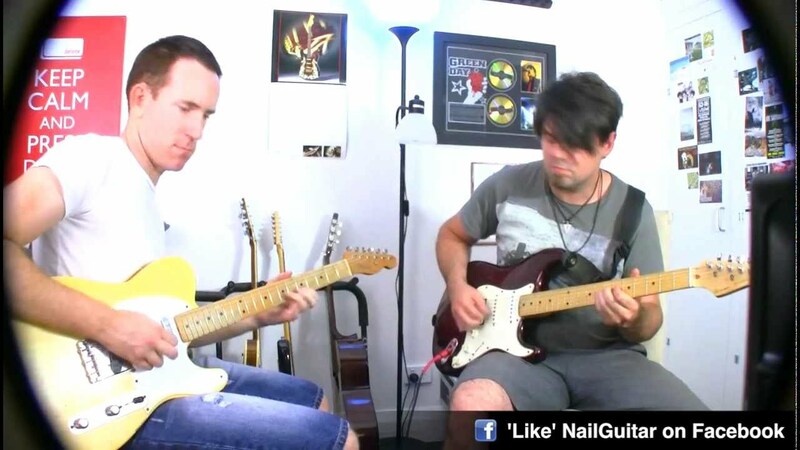 An excellent resource that I would recommend to any guitar tutor." No more embarrassing wonky arrows. No more excuses for lousy looking strumming diagrams. I have put it all together for you in this package. Just grab drag the file of your choice into photoshop or Gimp and in under a minute you'll have a great looking strumming pattern that you can use anywhere. If you've read this far its clear that you want and need a tool to create pro strumming patterns fast and easy, and your no doubt sick of drawing diagrams by hand. and take your videos and hand outs to the pro league! 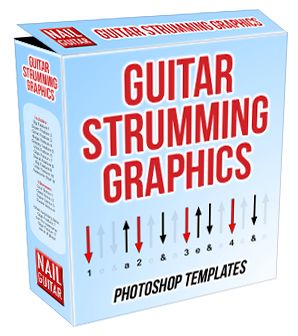 Get Guitar Strumming Graphics Now! This special 50% OFF launch offer is for a very limited time. When the counter hits zero the price will go back to $37. Is Guitar Strumming Graphics compatible with both Windows & Mac? Yes, the templates can be opened and edited in Photoshop or Gimp on either a Mac or PC. Is Guitar Strumming Graphics available as an app for my tablet or phone? Guitar Strumming Graphics is currently not available as an app. Register your interest in an app version here. Yes, our products are sold through E-junkie.com - they are one the biggest and most trusted online retailers specializing in digital delivery of products. At check out you will be prompted to enter your email. 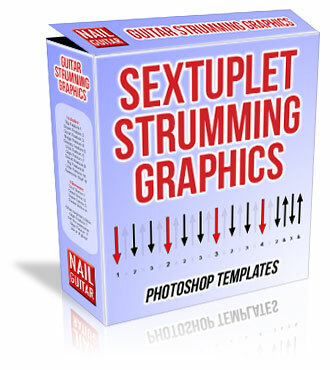 Immediately after purchase you will be sent a secure download link to start your Guitar Strumming Graphics download. easier than ever before. Click the “BUY NOW” button below! 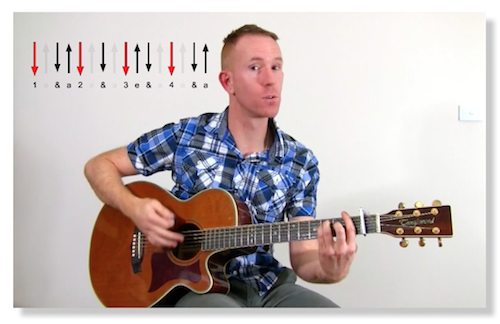 Would you like your students to learn strumming patterns faster? Teaching strumming patterns with references to songs makes them relevant and provides motivation that your plain old sheet of rhythms cant provide.